After the driest start to wet season in 27 years for Darwin, the monsoon trough looks to arrive in the next few days. So far this wet season, Darwin Airport has recorded 439mm of rain in the gauge from October 1st until 9am January 20th. On average during this period, Darwin sees 719mm, making it the driest start to the wet season since 1992. In Western Australia’s Kimberley, it has also been a dry start. While in the wet season to date, Wyndham would usually have 355mm recorded, they have have only recorded 236mm. Falls this low have only happened twice before in the last 40 years, in 2012 (196mm) and in 2003 (95mm). But while the Northern Territory and WA have failed to see good rain, Cairns and the surrounding Queensland Coast have enjoyed a very wet start. Cairns has recorded 953mm so far this wet season, compared to an average of 582mm. This makes it their wettest start in 10 years. 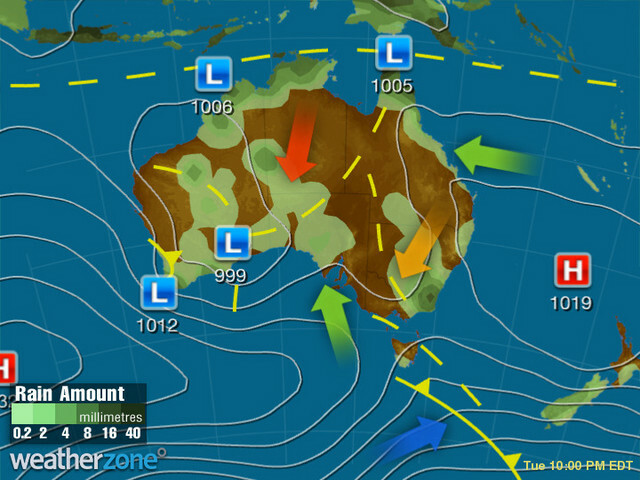 The monsoon has developed north of Australia over this weekend and will slowly edge its south, most likely arriving around Tuesday or Wednesday. The latest the monsoon trough has ever arrived was January 25th in 1973, making this year one of the latest monsoon onsets on record. With the monsoon set to arrive this week, there is an increased chance of tropical cyclones to develop over the waters off Australia. A tropical low off the Arafura Sea is considered a small chance of developing into a Tropical Cyclone early in the week, with a higher chance by the end of the week. It is important if you live in the tropical north to be prepared and to stay up to date with the latest outlooks issued by the Bureau of Meteorology.